Tina has been a dear friend since the mid 80s. Tina is an extraordinary person with tremendous talent. She is an accomplished musician with the voice of an angel. You can visit Tina's web site and learn all about her ministries and music at Eyes of Faith. 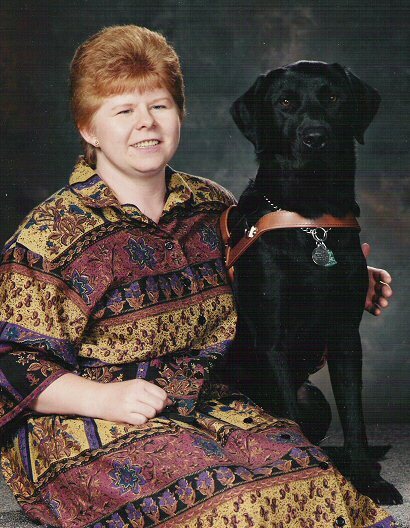 Audrey was my first guide dog. 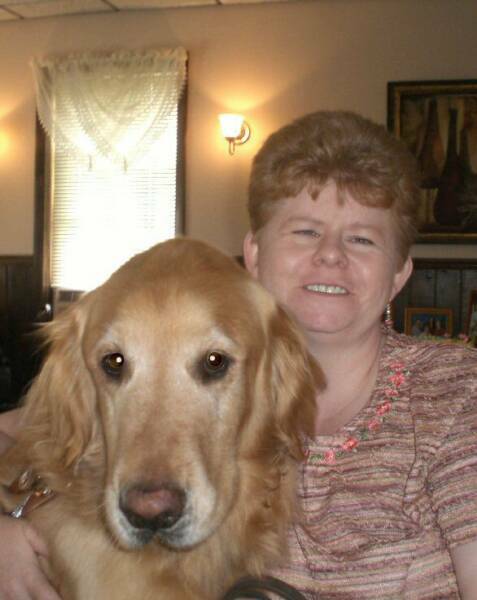 I met and trained with Audrey at Guiding Eyes for the Blind, Yorktown Hts. NY. 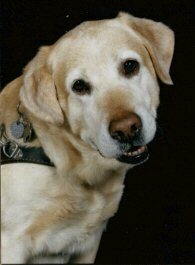 Audrey was a sweet natured yellow Labrador who changed me life so dramatically. She brought to the surface all of the confidence that had been hidden deep inside of me, and she opened doors for me that I never even knew existed. I met Audrey on Valentine's Day 1985 and she forever became my heart. Audrey passed away of cancer and kidney failure June 16, 1994. I miss her dearly. I met my big boy Merlin at GEB in August 1991. He was known as "Mr Perosnality" by all who knew and loved him. Merlin was a very large black Lab who took his job as my guide very seriously, yet was about the silliest fella I've ever know. He had a huge heart and a huge smile, and he flashed that smile and showd his heart to everyone. I miss my sweet big bubba boy. He passed away Nov. 20, 1998 of a rare throat cancer. He was 9 yrs old. I met my girl Gwenyth at GEB March 4, 1999. She was a female version of Merlin... a gorgeous black Labbie girl with personality plus! Gwendy was my perfect girl. Her guide work was superb and she loved leaping into that harness. I thought Gwendy would be the dog that would be with me forever... but sadly she developed a rare neuro-muscular disease at the young age of 6 yrs. She passed away three months after she was diagnosed. I held her and bid a tearful so-long on Aug. 13, 2003. I miss that girl more then words can tell. Kandi & I met at GEB in August 1991 when I went to train with Merlin. 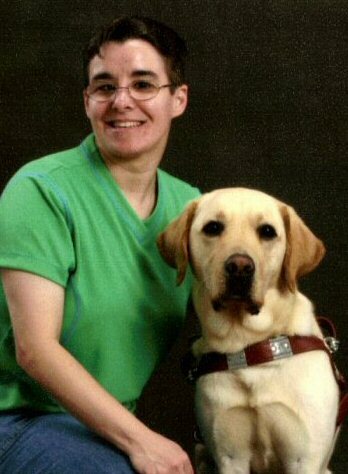 Kandi was there to meet her first guide dog Walden, the very handsome yellow Lab above (left). Kandi was home-trained with her second guide Eben, the big lmoose of a black lLab (rt) next. 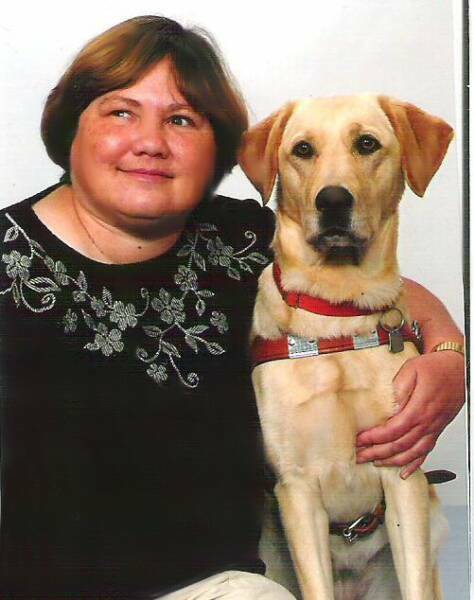 After Eb's retirement Kandi was home-trained with her current guide Waldo, a very sweet and handsome yellow Lab. Nolte is my 4th guide dog, just retired this past Summer. 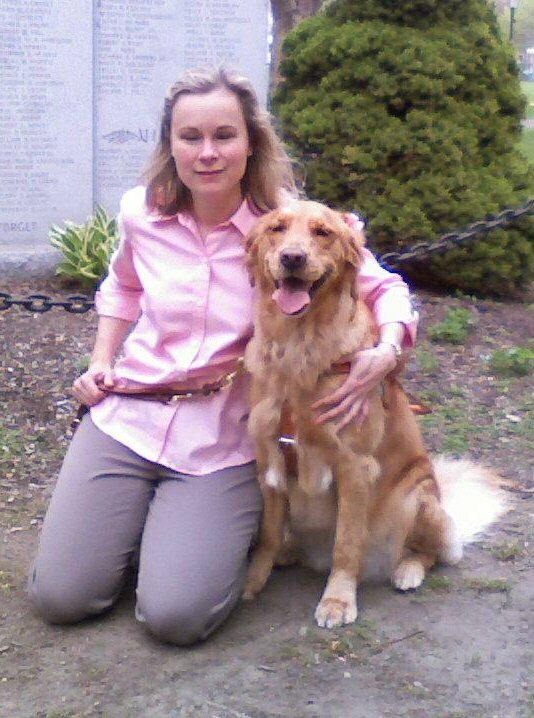 He's a wonderfully debonair Golden Retriever trained at The Seeing Eye in Morritown NJ. Nolte is one of a small number of guide dogs trained to work on the right side. Guide dogs usually are trained on the left, but due to injuries in my left hand and arm I'm not able to work a dog any longer on the left side. So Nolte was chosen for me and trained on the right. Nolte has been a superb guide and it's very sad that he had to retire so young. He's about the sweetest fella you'd ever imagine but also a big goofy guy who loves to play! I trained wth Nolte in Nov/Dec 2003. 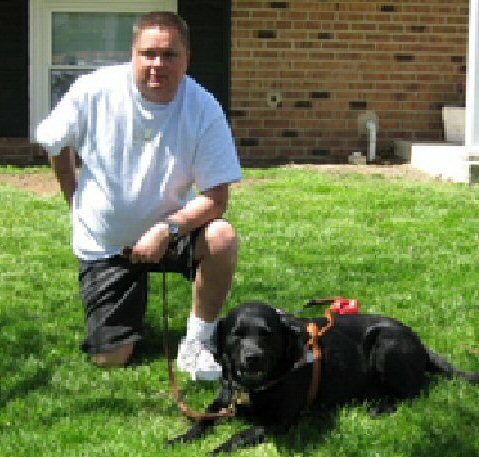 Will and I met at The Seeing Eye when I got Nolte and he got his big ol' black Labbie boy Teubert. Will and Teubert live in Virginia. Website: The Seeing Eye, Inc.
Website: Guiding Eyes for the Blind, Inc.
Website: Fidelco Guide Dog Foundation, Inc.
Website: Guide Dogs for the Blind, Inc.
Website: Guide Dog Foundation for the Blind, Inc.
Website: Guide Dogs of Texas, Inc.
Website: Leader Dogs for the Blind, Inc.
Website: Southeastern Guide Dogs, Inc.
Annie & I met at GEB when we were getting our first guide dogs, February 1985. We became great friends from the start. Annie is working with her 4th guide, Gladys... what a sweet tiny little Labbie she is! What dog breeds are used as guides? The dog breeds that various schools train as guides are: Boxers, Doberman Pinschers, German Shepherds, Golden Retrievers, Goldadors (cross between the Golden Retriever and Labrador), the Hungarian Vizsla, Labrador Retrievers, Labradoodles (cross between the Labrador and a Standard Poodle), Smooth Coated Collies, and the Standard Poodle. The Labrador Retriever is the dog most often used as a guide in programs throughout the world. The actual cost involved in breeding, raising, training, and placing a guide dog with a blind or visually impaired person differs from school to school but generally falls within the rage of $26,000 - $40,000 per dog. Guide dog schools are non-profit organizations and rely solely upon donations. Do you have to be totally blind to get a guide dog? No. 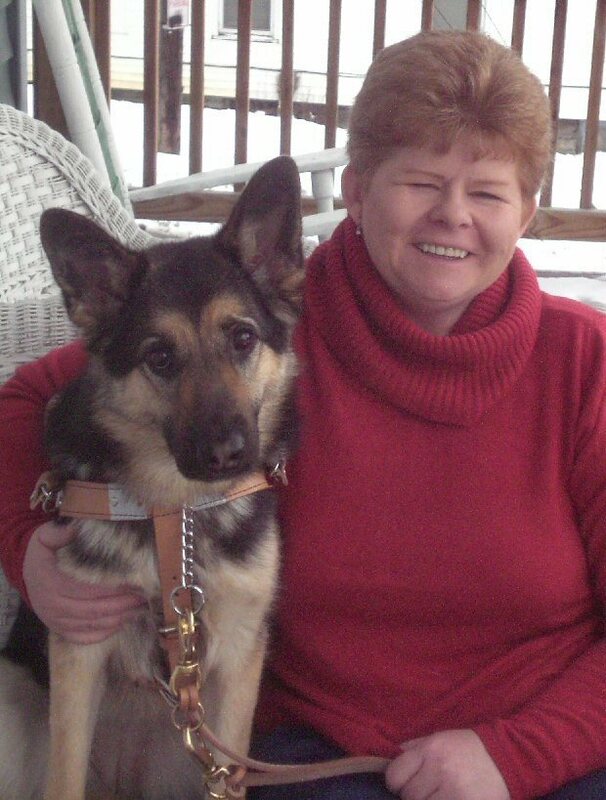 Many schools today recognize the benefits a guide dog offers to those who have low vision. However, in order to qualify, an applicant must be legally blind--no more than 20/200 vision in their better eye with standard correction or a visual field of no more than 20 degrees in their better eye. A few schools are more selective, based on the degree of functional vision a person has remaining. But everyone who qualifies must be legally blind and have a need for the dog as a mobility aid. The average working life of a guide dog is six to ten years. At that point, they may be ready to retire and be just a pet. Are guide dogs really as smart as they seem? The amazing work that guide dogs do is the result of countless hours of painstaking practice and unending patience. The guide dog schools that have their own breeding programs strive for two main characteristics: intelligence and willingness to please. Guide dogs have been bred to be intelligent, but they have also received intensive and specialized training. Will a guide dog mess up the floor? No. Guide dogs are taught not to relieve themselves inside or while they are wearing the harness. Most guides are kept on a strict relief schedule and most handlers will relieve their dogs before entering a location where they may be inside for a long time. The only reason a guide dog should ever have an accident would be if they were sick and could not help themselves. Is a guide dog allowed on the furniture? Guide dogs are taught not to get on furniture and most schools encourage their students to maintain that rule. But once a student completes the training and returns home, it is a matter of personal choice to permit their dog on the furniture or not. Regardless, a guide dog should always obey their handler's command to get off. Is a guide dog treated like a pet at home? Yes and no. Guide dogs and their handlers are together 24 hours a day, seven days a week. The bond of love and mutual dependency that develops between dog and handler is unlike anything most people experience with their pets. Although a guide dog is a highly trained service animal, they are still a dog and they need to be loved and petted. Many guide dog owners will tell you that their dog is their best friend. But if you allow a dog to break the rules at home, they will break them elsewhere too. A certain level of discipline must be maintained or their guide work may suffer. So, while a guide dog is treated as a pet in many respects, they are also a working dog and must be held to appropriate standards of behavior. Guide dogs are trained to move forward in a straight line, turn right or left, and follow a sidewalk or path as it curves around. The handler must know how to get to their destination before they can tell the dog how to do it. Although they are trained to follow a straight line to its end and then wait for the handler's next command, most dogs will learn the routes they walk frequently. Once they have learned a route, the handler no longer needs to tell them each turn along the way. Some dogs will even learn to associate a route with a word such as store, bank, or home. However, in unfamiliar territory, the handler will need to give the dog explicit commands at each turn along the way to their destination. A guide dog cannot read traffic lights or walk signs. Their blind or visually impaired handler must listen to the sounds of the traffic and decide when it is safe to cross. The dog serves as a safety net. If the handler makes a mistake or misjudges the traffic, the dog should refuse the command to move forward. However, once they are in the intersection, the dog should guide their handler safely to the opposite side. Cars turning a corner can be especially hazardous. There have been many instances when a guide dog has physically pulled their handler out of the street and out of harm's way. How does a guide dog know when to get off the elevator? A guide dog cannot read floor numbers. Their handler must tell them when to exit the elevator. A totally blind person might count the "dings" while a partially sighted person might have enough vision to read the display. In either case, the dog depends upon the handler to know when to get off. Can a guide dog go on an escalator? Yes. Most guide dogs are trained to ride escalators. The important thing to remember when working a dog on an escalator is to get them moving before the steps flatten out so that they do not get their feet or nails caught in the mechanism. Can guide dogs go into stores and restaurants? Yes. 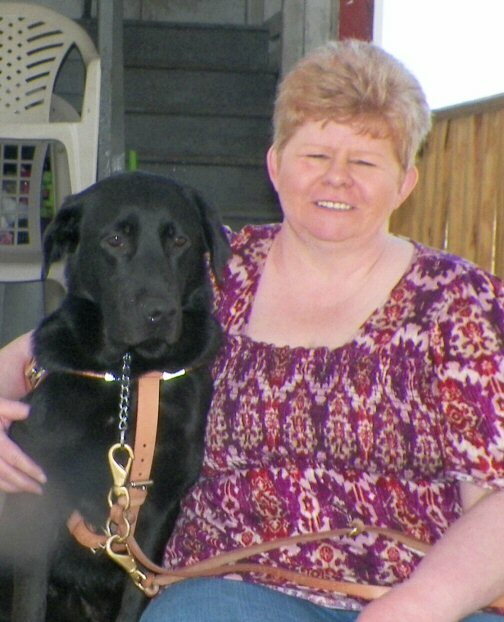 A blind person accompanied by a guide dog has the right to go anywhere the general public is allowed. This includes restaurants, medical centers, stores of all kinds, taxicabs, airplanes, etc. These rights are guaranteed by Federal and State Laws. Does a guide dog ever disobey? Guide dogs are not robots, they are dogs and they do make mistakes. New guide dog users go through a training program where they learn how to correct the dog and maintain the dog's training. There are times, however, when it is desirable for the dog to disobey. Most guide dogs are trained to refuse a command when that command would lead to danger--walking out into traffic or over the edge of a drop-off, for example. This concept is known as "intelligent disobedience." A handler must read their dog well enough to know when a refusal to obey signals danger and trust their dog enough to follow where they lead. I saw someone jerk their dog's leash. Are they abusing their guide dog? No, they are giving their dog a leash correction. Guide dogs sometimes make mistakes. They may be distracted or they may simply be testing their limits. In either case, failure to correct an undesirable behavior only teaches the dog that the behavior is acceptable. A verbal correction is usually sufficient. But if the dog is not paying attention or their behavior could compromise the safety of the team, a leash correction may be needed. Running a curb, for example, is serious business. It can get both dog and handler killed. A proper leash correction doesn't hurt the dog in any way and, when combined with a firm "no," it will get their attention. When the dog stops the behavior or performs the task correctly, they should be given lots of warm praise. A leash correction looks far worse than it is. Guide dog schools get calls everyday from well-meaning people who confuse a proper leash correction with abuse. It is not. However, a handler should never hit, kick, or choke their dog. That type of behavior is definitely abuse and should be reported. Will a guide dog bite? No. Guide dog schools are extremely careful in their screening procedures. Any show of aggressive behavior and the dog is dropped from the program or career changed into another field. Guide dogs are socialized from birth to be gentle and loving towards people and well-behaved around other animals. Can I pet your guide dog? You should always ask permission before petting a guide dog. Whether walking down the street or waiting in line at the supermarket, while "in-harness" the dog is on duty and it is likely that the handler will not allow petting. There's a very good reason for the "no petting in-harness" rulethe safety of the guide dog team depends upon the dog's ability to ignore distractions and focus on their work. Petting "in-harness" teaches the dog that interacting with people while they are working is acceptable. A dog that is used to being petted "in-harness" could easily become distracted and lead their handler into traffic or drag them down a flight of stairs in their attempt to get to someone they know. While the harness is on, a guide dog must focus on their work. But "out-of-harness" they are an ordinary dog that needs to run, play, and be petted. Guide dogs know the difference between what is expected of them "in-harness" and "out-of-harness." It's very important to keep those two worlds separate. Most handlers will allow petting "out-of-harness" as long as it doesn't negatively affect their dog's guide work. It is up to the individual handler to know their dog's personality and decide whether or not to allow others to pet their guide. Can I feed your dog? A guide dog must be well behaved in public where food is being served. Begging or stealing food is totally unacceptable. One of the reasons why guide dogs are so well mannered in restaurants and other eating establishments is because they are never given human food. They know they can't have it and so they don't expect it. Besides, much of the food we eat is not good for dogs. For these reasons, guide dogs are kept on a strict diet of high quality dog food that is designed to meet their nutritional needs and people food is not allowed. Can I talk to a guide dog while they are working? No. Distracting a guide dog while they are working can be dangerous for both the dog and their handler. Some people whistle to get the dog's attention. That's like taking the steering wheel away from someone while they are driving--it's not a good idea. How do I give directions to a guide dog team? Incredible as it may seem, some people give their directions to the dog! Guide dogs understand the commands they have been trained to understand. They do not know language in the way that we do. So, unless you can speak canine, please give your directions to the handler and not the dog. Aaaahhh... the wonders of guide dogs! 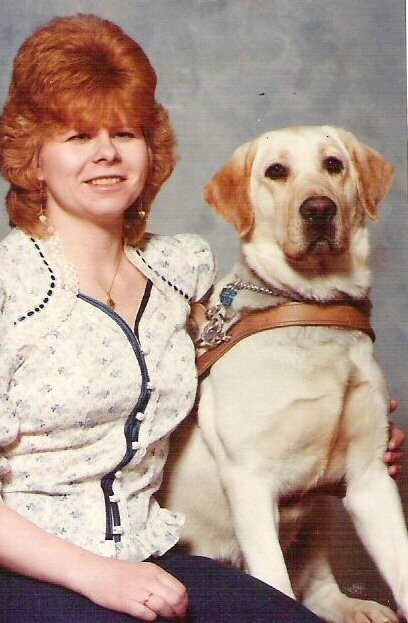 I've been partnered with 6 guide dogs since 1985. All have been superb guides and companions. On this page you'll find a brief blurb about each of my guides and a few of my friends and their guides as well. Also below is a list of commonly asked questions about guide dogs, and a list of guide dog schools and contact information. Karla is a sweet-natured little German Shepherd girl, my 5th guide. Karla was my second guide from The Seeing Eye. We were home-trained together just after Christmas 2008. Working with a Shepherd was both an adventure and a challenge... 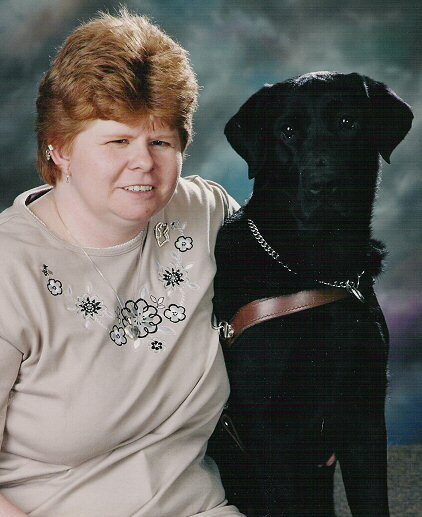 Unfortunately over time Karla showed signs she was not happy being a guide dog, and I made the decision to retire her in July 2010. She went home to the wonderful family who raised her as a pup where she was spoiled and loved until her far too early death in October 2013. Love you little La La... you taught me so much! Jingles is a Lab/Golden cross from The Seeing Eye. She and I were home-trained together in April 2012. This little spit-fire of a girl has been a joy since the moment she leapt into my life... thus her middle name, Joy! Jingles has proven again and again to be an excellent guide and has fit into the family as if she's been here forever. Jingles competed in the American Humane Assocation Hero Dog Awards. She won 2013 Hero Guide Dog, and was presented with her award by Betty White and Pauley Perrette on October 5 2013 in Hollywood CA. I look forward to mamy years together with my beautiful little hero girl. You can view Jingles' Hero Dog Awards tribute video HERE.